Is Your Haystack Missing a Needle? Using manual testing to determine if your application is missing any files is worse than looking for a needle in a haystack: it's like trying to determine if your haystack is missing any needles! One tester tells the story of how some clever coding saved his project a good deal of time and quite a few headaches. Turn to The Last Word, where software professionals who care about quality give you their opinions on hot topics. This month, see why one practitioner believes there's no such thing as a best practice. Need a place to go to get the solutions you've been craving? Management Fix is what you've been looking for. In this issue, find out how to manage when you're asked to grade on a curve. We're pleased to bring you technical editors who are well respected in their fields. Get their take on everything that relates to the industry, technically speaking. In this issue, read about the importance of recognizing inconvenient facts—and how finding a way to change them could be the key to success. Just as a spider spins a web to capture her prey, testers weave an intricate net of ambiguity and conflict to catch program bugs. Find out how to use complex tests to expose program weaknesses and errors. Stumble-free code and knowledge transfer requires a facilitated, structured process. Learn how to ease the transition from development to maintenance. 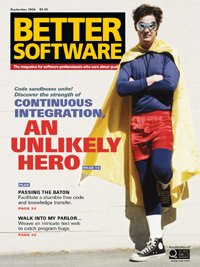 Code sandboxes of the world, unite behind a new leader: Continuous Integration (CI). Automated and customizable, CI gives you the ability to know at the push of a button whether your application is working or whether it needs a tweak. It brings together the disparate code of countless developers and provides a real-time gauge of your application's health. Never fear nightly (or, egads! weekly) builds again. Rely on the strength of CI.